Wither by Lauren DeStefano (from S&S e-galley program) - loved this one! Oooo! Hope you enjoy Wither! Looks to be such an amazing read (as does everything else)! I've been wishing for Zombie vs. Unicorns, I love the cover! I can't wait to read some reviews about Across the Universe. I know it's early, but I'm curious about it! Oh, and I can't wait for Wither! I'm so excited for you for Across the Universe and Through Her Eyes. What a great mailbox this week! I keep hearing Zombies v. Unicorns is really good so I'm going to have to get that one as well. 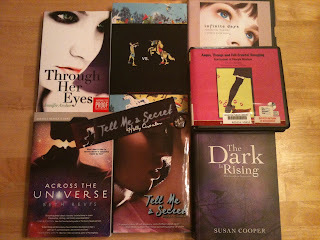 I'm happy Across The Universe got there safely :) I'm so super jealous you got Through Her Eyes, it looks really good! Wither looks super good too. I would love to listen to the Louise Rennison books on audiobook - I think that would be really entertaining given how those books are! Wither sounds amazing, I can't wait to see your review! Exciting for Through Her Eyes and Across the Universe, too! Enjoy! Wow! Great books this week. Have a great time reading! You had a great week! I just started Z vs. U last night and I like it so far. I really just like looking at it lol. Enjoy all your new reads! oh la la! such good books this week! i got that email about the S&S e-galley program too! but i'm still waiting to hear back about being accepted. I really want to read Wither! Hope you enjoy all of your wonderful books! Happy reading! Also - Angus, Thongs, and Full-Frontal Snogging is SO good. I love that series so much, ahaha. I have never listened to an audio book. I hope that you enjoy your books. Check out what I got In My Mailbox. Happy reading. Wither and Across The Universe! I'm really liked Infinite Days and can't wait for the next one! great books! can't wait to read Through Her Eyes and Wither. enjoy and happy reading!! Great books ! Tell Me a Secret sounds good !